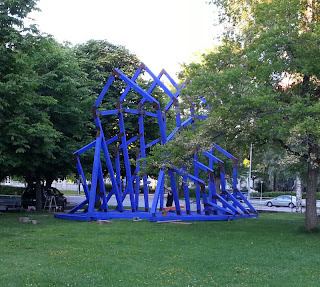 The blue Cathedral, a building without walls or roof, is being built in Sala town park aroand midsummer. As un symbol for human aspiration, Mats Lodéns massive work of art stretches up into the heavens and opens the onlooker´s mind to take in the whole universe. 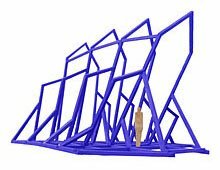 The striking ultramarine colour- bluer than a summer sky- comes from his artist grandmother and is used in his other major works at Säter and Gagnef. The project took off after Lodén received an arts grant from the Church of Sweden and sponsoring from Swedish wood industry in 2008. Five years later the Blue Cathedral became a site for solitary rest and reflection, an arena for reverence and recreation, poetry and politics-anything that brings people together. The Sculpture is being erected in Sala town park at midsummer. It will remain there until the middle of September. 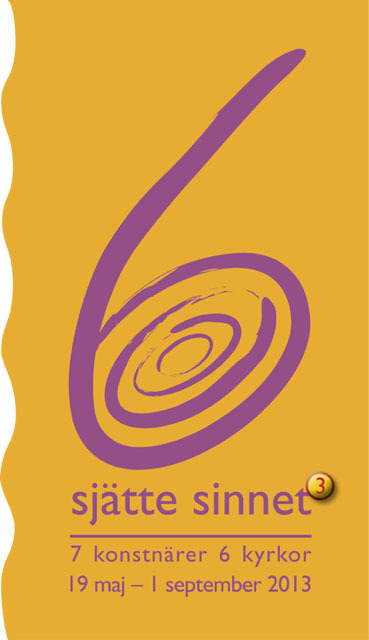 Now that the Diocese of Västerås opens it churches for the third time for contempory art with the theme The Sixth Sense, the visitor has a unique opportunity for contemplation. In a place shaped in bygone times by the expression of the most profound questions of our existence, we meet a modern expression of life`s struggle. What symbols do artist use to express hope and how does all this affect us? The Sixth Sense is a way for the church to be in a new time.